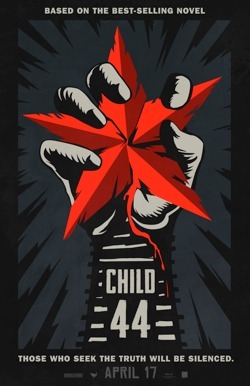 A politically-charged serial killer thriller set in 1953 Soviet Russia, CHILD 44 chronicles the crisis of conscience for secret police agent Leo Demidov (Tom Hardy), who loses status, power and home when he refuses to denounce his own wife, Raisa (Noomi Rapace), as a traitor. Exiled from Moscow to a grim provincial outpost, Leo and Raisa join forces with General Mikhail Nesterov (Gary Oldman) to track down a serial killer who preys on young boys. Their quest for justice threatens a system-wide cover-up enforced by Leo’s psychopathic rival Vasili (Joel Kinnaman), who insists “There is no crime in Paradise.” Summit Entertainment presents in association with Worldview Entertainment a Scott Free production, a Daniel Espinosa film.